Opening note: What follows below is a description, without real measurements, of how my mother, Ruth Roberts, made cornbread—without real measurements other than her good eye and hand. Eventually I developed some standard measurements that come close to her good skillet style cornbread. Those are at the bottom of this post. Scroll down if that's what you want. I admit it – I don't use a recipe for cornbread. I do follow a process that is nearly a ritual, though. My ritual combines ancestral traditions with the latest food news about the wonders of eating what is real, fresh, and grown close to home. Actually, in cornbread, the ancient and the latest views on what is good come together in joyous union. I put my mother's well-seasoned cast iron corn stick and corn muffin pans into the oven and turn it on to 450 F. I set some filtered water to boil in my electric teapot. I get out my former husband's grandmother's chipped pink ceramic bowl. I get out fabulous Weisenberger Mill stone-ground white cornmeal, soda, baking powder, and Celtic gray sea salt. Right about now I pull out the pans in the oven and put about a teaspoon of oil in each little spot. Yes, that much, maybe. I use grapeseed oil or olive oil, or, on rare occasions when I have it, bacon grease. Back into the oven until the pans start smoking! In the pink bowl I mix dry ingredients, something like this: a big scoop of stone-ground meal, a medium pinch each of soda and sea salt, and two big pinches of baking powder. Using a heavy whisk – a tool I never saw in my mother's or aunts' kitchens – I stir together those dry ingredients. I add a big swig of buttermilk, a very large egg or two medium ones, and a glug of oil, usually grape seed oil or olive. I aim for a thick texture. Whisk whisk whisk. By now the teapot has boiled the water and shut itself off. I pour in a medium swig of boiling water. Stir stir stir. If it's thin as a runny milkshake, it's about right. Out come the smoking pans. I use a 1/3 cup metal measuring cup as a batter-dipper and work as quickly as I can, pouring the thin batter into the sizzling oil in each little receptacle. Back into the oven until almost nut brown – maybe 15 minutes. Maybe 20. 1. Drizzle sorghum straight onto hot cornbread, buttered or not, and eat with a fork. 2. Make the Magical Mixture of sorghum and slightly softened butter. Spoon onto individual bites of cornbread baked in any shape. 3. Next day, split leftover cornbread and toast it in your toaster oven. Now it's crispy on even more surfaces. Repeat steps 1 or 2, or both steps 1 and 2, above. The promised recipe Maybe! Try it! Adapt to your taste! This is primarily a skillet or pone recipe. 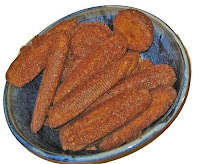 Note: for crispy cornsticks, the batter works better if it is a bit thinner (from hot water) and fatter (from bacon grease or other fat) than these proportions. But nothing matters as much as having the pans or skillets blazing hot and amply greased before you add the batter. Cornbread, when made Kentucky-style, has no flour. It is naturally wheat-free. Follow the baking steps above. 425 degrees works nearly as well as 450, and is a bit easier to manage.